Hello my friend. 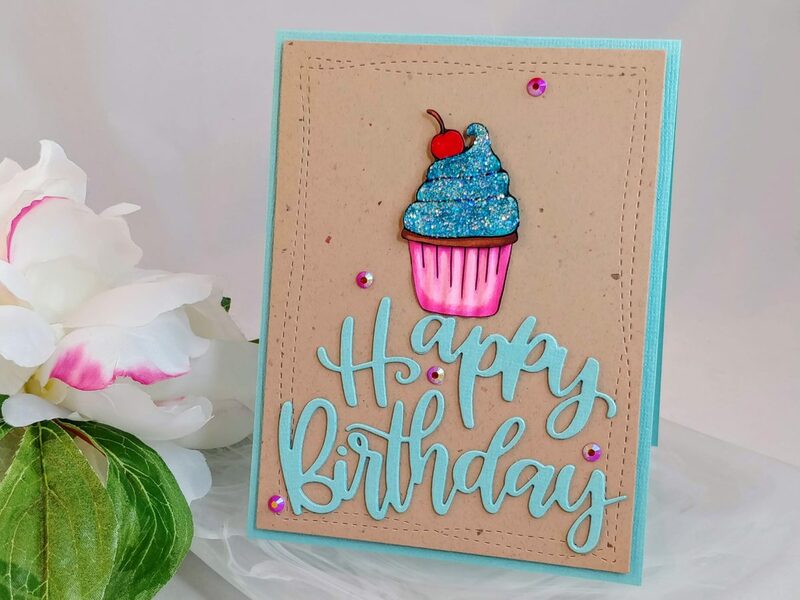 Today I’ve got a quick and easy birthday card for you, but I’ve added a few special touches that give this card a lot of texture and shine! 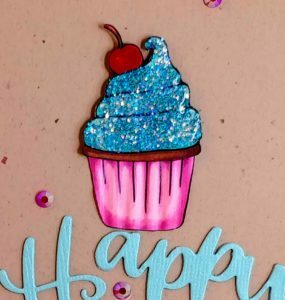 I started by printing the Cherry Cupcake digi-stamp onto cardstock and coloring it with Copic markers. This is one of several cupcake digis available from Heartcraft Paper and they are so sweet! I can’t wait to play with them all. After it was colored, I cut it out with my ScanNCut. Then I decided that I wanted to separate the top of the cupcake from the bottom, so I just cut it in half with scissors. To add texture to the bottom of the cupcake, I rolled it through my paper crimper. I made a top folding A2 card base from a shimmery teal cardstock. Then I popped up a wonky stitched rectangle with a thin piece of fun foam and attached it to the card base. I die cut the sentiment three times and layered them together; the top layer is the same shimmery teal paper that the card base is made from. I glued the sentiment to the bottom of the stitched rectangle. Before I glued the cupcake to the card, I added a thin layer of Caribbean glitter paste to the frosting. It was very shiny, but the glitter was a little darker than I wanted, so I added a layer of Ice Stickles to lighten it up a bit. That added a little more texture to the frosting too. Then I coated the cherry with Diamond Glaze so it would be shiny as well. Once it was dry, I backed it with a thin layer of fun foam. I glued the corrugated bottom of the cupcake to the card, and popped the top portion in place above it. I finished the card with several Max Red flat backed gems. I love how fast this card came together, but still is very pretty and has lots of texture and dimension. Do you have a quick and easy card design that you want to share? 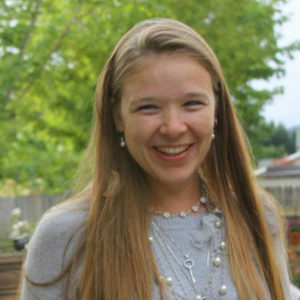 Just like last month, Heartcraft Paper is hosting a link party! Click the button below to see all of the fun cards the design team has created and share one of your own!